Peary is overly generous in his assessment of this “oddball” indie film, arguing that its liberal black humor “gives it the distinction of being the most charming of the horror film’s cannibalism subgenre”. In truth, it’s a rather tedious, poorly made exploitation flick with countless logistical loopholes and (mostly) amateurish acting. Gillin’s performance may be “winning”, but her character — despite being a college student — is hopelessly stupid, and her enthusiastic reaction upon receiving an anonymous invitation to a strange hotel borders on imbecility. The initial meat-eating dinner scene — which goes on for nearly 10 minutes — presupposes that viewers will giggle in delight simply over watching Gillin and her equally clueless fellow guests eating human flesh without knowing it; why is this funny? 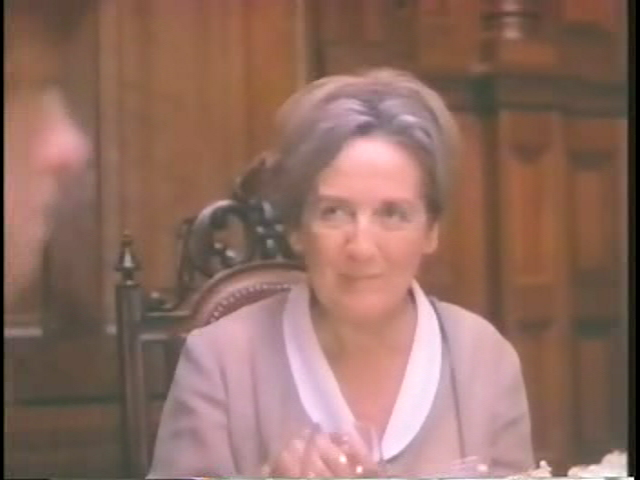 The best aspect of the film by far is the sly performance by Mary Jackson, playing a deluded old woman who would give any grandchild the willies. No; this one is strictly for fans of cannibalism flicks. Can’t say I agree here, but I can’t say I disagree either. I’ve tried to write a review for this one for ages, but it never comes out. I think it’s probably because all of your points but I just don’t care. I love this movie. I don’t even remember where the hell I picked it up — some VHS closeout at a dying Mom & Pop store, maybe. I keep the cassette around even though I can buy a copy of comparable quality in one of those 50-DVD mega-packs. I think this and Island of Lost Souls are the two reasons I still own a VCR. This is a bad, bad, bad, and boring movie that doesn’t work on any level at all and is best forgotten.